The official start of fall began a couple of weeks ago. For most, the change of season is a welcomed shift. Soon the leaves begin to colorfully change, and the chill air allows us to spend more time outside without breaking a heat and humidity induced sweat. Celebrate the fall season by trying something new on your porch, in your garden or even in your home. Play around with new colors or try a new plant in the landscape. Fall gives us a chance to form a whole new garden personality and welcome holiday guests with flare. Here are a few of our favorite fall decorating tips to make your holiday season more colorful. Planting with pumpkins: Halloween and Thanksgiving are the perfect occasions for adding pumpkins of all sizes, shapes and colors to decorative arrangements. For something a bit different, why not plant in the pumpkin instead? Plant in larger pumpkins and gourds for outside or porch displays; use mini-pumpkins planted with cyclamen for temporary indoor table-top decor. When you’re done with your display, plant the entire thing right in the ground, pumpkin and all! Adorn your creations with berry sprigs, cut foliage or other natural items from your garden. TIP: Personalize your fall greeting display: Use a paint pen to write a friendly greeting on larger pumpkins. Or scrape your house numbers into stacked pumpkins to reveal the lighter orange shades underneath the outer skin. Gourds in a variety of colors and shapes are fall festive! Welcoming porch vignettes: What better way to welcome guests this fall season then with a wheelbarrow filled with pumpkins and gourds? Choose a variety of colors, shapes, and sizes to make the display especially charming. Don’t have a wheelbarrow? No problem! It could be a basket, a chair, a wagon, or repurpose any old container such as a toolbox. Find wonderful, charming pieces at your local vintage shops. What kind of cool season color should you plant? Succulents, herbs, zinnias, pansies, violas, kale and asters are perfect for fall. TIP: Hardy herbs can be a great addition to your fall planter or pumpkin container. Several of the winter-hardy herbs such as rosemary, sage and thyme not only taste good, they look fabulous in the landscape during colder seasons. Sage blooms in many colors -yellow, red, blue, purple, white. Rosemary - an evergreen with strong, straight stems – can grow into an impressive bush lasting many years. Don’t just decorate horizontal … go vertical: Stack your large base pottery with smaller pots, pumpkins, gourds, tall plants, adding plants and knick knacks you wouldn’t normally find in outdoor arrangements. Use holiday ornaments, small toys, dry accents such as cornstalks, or fall faux fruits for accents. You can even create dramatic natural sculptures by stacking pumpkins in alternating colors. When you stack pumpkins, be sure to remove all the stems except for the one on top. That way they will sit more level and your stack will be more stable. Sandwich them with wreaths or straw for a unique look. TIP: One creative and colorful way to infuse a bit of fall personality into any garden is to brighten up the garden decor. Painted pots make a lively impact on your outdoor spaces in minimal time. Plant more perennials: It’s easy to forget that we need to plant for every season. There are many beautiful foliage and blooming fall perennials. Fall is also the best time to plant perennials in the landscape, especially if you need to refresh or replace specimens that might have expired in the summer heat. Why not also add perennials to containers? If they outgrow their pot, move them to the garden. Right now, local nurseries should have a good selection of autumn sage, coreopsis, rudbeckia, lantana, cone flower and more. 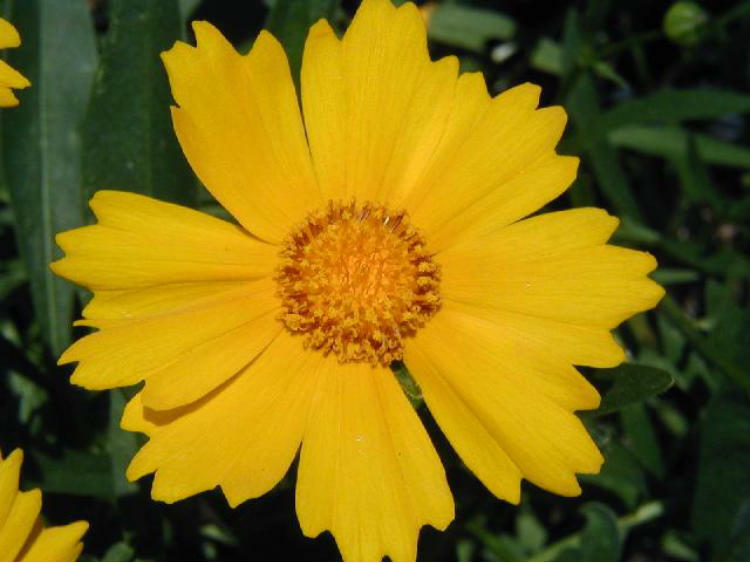 Coreopsis is a cheery fall bloomer! Need more inspiration for decorating your fall garden? Give us a call! Now is a great time to tidy, refresh and re-imagine your landscape.